It's hard to fill a newspaper when there is no real news, and it's 36 hours until England play their Euro 2012 quarter-final against Italy. Thus The Sun's carries a dreadfully thin back-page lead proclaiming that England will scoop a '£20 MILLION JACKPOT' should they defy all logic and win the tournament. So, it's not £20m to start with. And England have already 'won' £8.9m of it - over the rest of the tournament, they are playing for £10.4m. And that's not all. If England win the tournament, their players would be due bonuses worth around £4m, significantly reducing the FA's windfall. And The Sun also admits a longer stay means more flight and accommodation costs. By the end of the piece, even The Sun's Shaun Custis has dropped the pretence, and the £20m jackpot has instead become a "healthy profit". 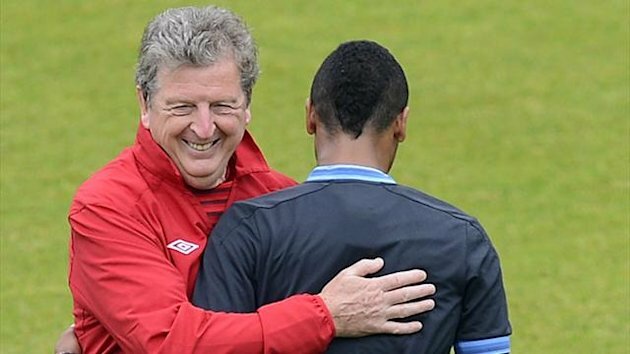 And in any case, the article's only quotes come from Roy Hodgson, saying he does not know or care how much money an England victory would be worth. The Sun also has a two-page exclusive interview with Rio Ferdinand! Well, this should be exciting - the full story of his omission from the England squad, and his true feelings about John Terry. Erm... not quite. There is not a single mention of Terry, or of "footballing reasons", or really anything you might want to read. Instead there's just some fairly obvious stuff about the importance of avoiding cliques. Clearly it was a pre-condition of Ferdinand agreeing to do the interview, but you can't help but feel those two pages would have been better served with some fictitious story about Mario Balotelli going on Polish TV to present the weather in his undercrackers. If there's one word likely to get Fleet Street hacks going while England are at a major tournament, it's 'Bulldog'. Thus Ashley Cole has the tabloids swelling with patriotic pride with his description of England's team spirit at Euro 2012. The Mirror goes big on Cole quotes: "We're like 11 bulldogs who will never give up, who will always work for each other and basically die on the pitch for each other." Yikes - sounds more scary than inspiring. Thankfully, Cole did not extend the simile and promise to maul the faces off Italy on Sunday. There is also 'news' of a cheeky exchange in Italy's press conference, in which goalkeeper Gianluigi Buffon suggested he would watch a dirty movie rather than a DVD of England's penalty takers. Wouldn't we all? 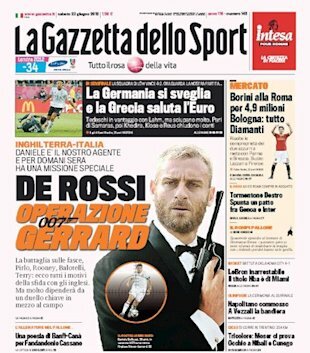 The Italian papers are similarly stuck for genuine content - the normally excellent Gazzetta dello Sport has been reduced to a weak Photoshop effort of Daniele De Rossi as James Bond alongside the headline: "Operazione Gerrard". Gerrard may have a reputation for going to ground easily, but the England skipper will be forgiven for taking a tumble if De Rossi unloads that pistol on him. Back in Blighty, several papers go for the obvious "Greece out of Euro" joke - and why not? The Guardian goes even further with a desperately contrived: "German efficiency rules the Euro zone." In general, though, there is plenty of praise for a Germany side that brushed past the desperately negative Greeks last night. There will be plenty of time for insults should England defeat Italy on Sunday - Germany would be their semi-final opponents.